2) Eyes. With a yellow marker, draw two circles. Fill them in. You can put a another black circle in the middle for the pupil, as I have. Or not. I do think it adds something of a realistic effect. 3) Nose. Draw a long oval shape vertically with a green marker. Fill it in. 4) Mouth. Draw a long oval horizontally with a red marker. Fill it in. Erase a few triangles for teeth. 5) Ears. Draw 2 squiggles on the far sides of the eyes with a black marker. 6) Hair. Draw some squiggles with a purple marker for hair. 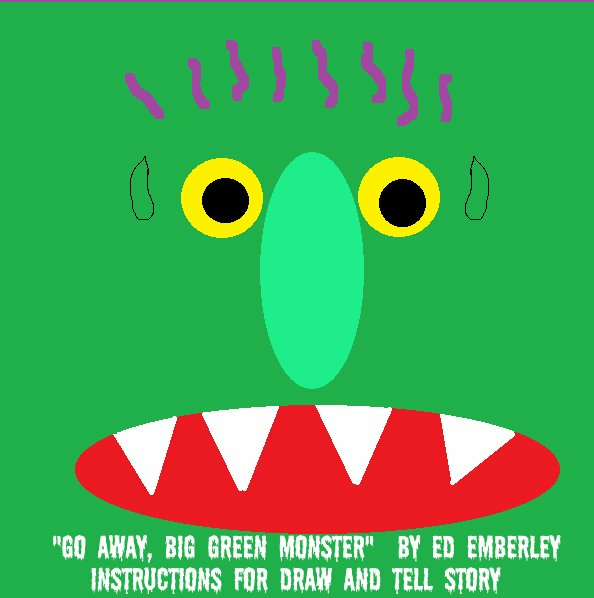 Then, as it's time to GO AWAY for the big green monster and you can take an eraser to your beautiful frightening creation. This is so great! I've always wanted to do a draw and tell story but I've been terrified to try. This seems easy enough and fun. =) Thanks for sharing! I love that this story can be used for so many different activities. I'm going to have to try it as a draw and tell now. Thanks, Trista and Sarah. I should probably mention that I haven't tried this one with the kids yet as we're on a storytime break, but I don't see why it wouldn't work. You can make the pauses while you're drawing seem really suspenseful and dramatic. Since I prefer to draw on a computer, I'm actually thinking it might be fun to try this on a laptop with a projector. This is great. It would be lots of fun to have a class of older kids visit the library and tell small groups of storytime families each different version of the same story. I love this - I'm going to do it with 2nd graders in my tech class,and they'll use Google Draw to create it. Thanks for the idea!